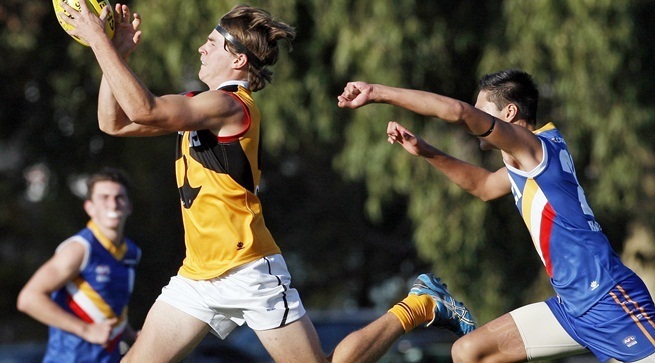 AFL Victoria’s TAC Cup competition fixture for 2014 has now been released. The season will kick off with Metro Round on the weekend of March 22, with 18 rounds across the year. Regional areas of Warrnambool, Hamilton, Lavington, Camperdown and Mildura are all fixtured to host TAC Cup games in 2014, with the 12 TAC Cup regions to face increased matches against New South Wales (seven), Queensland (six), Tasmania (four) and Northern Territory (three). The interstate sides will not only participate in the lead up to the NAB AFL Under 18 Championships as per previous years, but for the first time will feature in games post the Championships due to there no longer being division one versus division two matches. AFL Victoria State League & Talent Manager John Hook said the success of the TAC Cup competition in helping develop future AFL players and changes to the 2014 NAB AFL Under 18 Championship structure, has led to other states increasing their participation during the year. In the various NAB AFL Drafts, 38 players from the TAC Cup were provided a spot on an AFL list, with 26 selected in the November Draft, and another 12 given an AFL Rookie position. “The TAC Cup again provided the most draftees from across Australia, and it is pleasing to see the majority of them formed part of AFL Victoria’s Country and Metro Academies,” Hook said. Highlights of the fixture include five Peter Jackson VFL curtain raiser games, one AFL curtain raiser with the Calder Cannons to face NSW on the SCG on June 14 and a country triple header at Bendigo’s Queen Elizabeth Oval in round four. The Laguntas program, which saw three indigenous players involved in the inaugural program drafted in 2013, will again play games during three of the five allocated Development Weekend’s in the fixture. The programs final game of the year will be played during the AFL Multicultural Round on the weekend of July 19, and will be against the Majak Daw Western Jets Squad. A number of VFL venues will host increased TAC Cup games in 2014, with Avalon Airport Oval, Trevor Barker Beach Oval, Box Hill City Oval, Burbank Oval and North Port Oval all scheduled for matches next year. In a bonus for Victorian football fans, they will also get two opportunities to see the best of AFL Victoria's Country and Metro Academies go head to head, with Visy Park the battle ground on both May 18 and June 8. Click the link below for the full TAC Cup fixture.